Long-term refers to a holding period (from entry to exit) of more than a week and sometimes as long as several months. The great virtue of a longer holding period is that once you have identified a trend, you are likely to make a greater profit than when trading in-and-out over shorter periods. Not only do you save on transactions costs, you save your own time. The drawback is that trends never move in a straight line and it can take nerves of steel to sit out the inevitable pullbacks. You also need confidence in your ability to differentiate between an ordinary pullback and a trend reversal. Most of all, long-term trading usually entails blending fundamental analysis with technical analysis, a process that is complex and challenging but can put you at risk of embracing an ideology that is either wrong or not applicable to your particular trade. When there is a disconnect between what the chart shows is happening vs. what ideology dictates should be happening, the pragmatic solution is to ditch the ideology. After all, the essence of technical analysis is empirical observation. If observations clash with theory, the theory needs to be discarded. This can be very hard to do. For example, the environmental charity Greenpeace lost €3.8 million betting the euro/dollar would fall after the European Central Bank cut rates in early June 2014. The error is understandable enough — currencies usually do fall in a falling interest rate environment. But this was a case where other factors carried more weight, including the long-standing bias in favor of the euro because of the ECB’s anti-inflation credibility and a sharp-eyed appreciation of the likelihood the Fed would remain dovish. The long-term trader tends to use daily charts and will also consult weekly and even monthly charts, too. 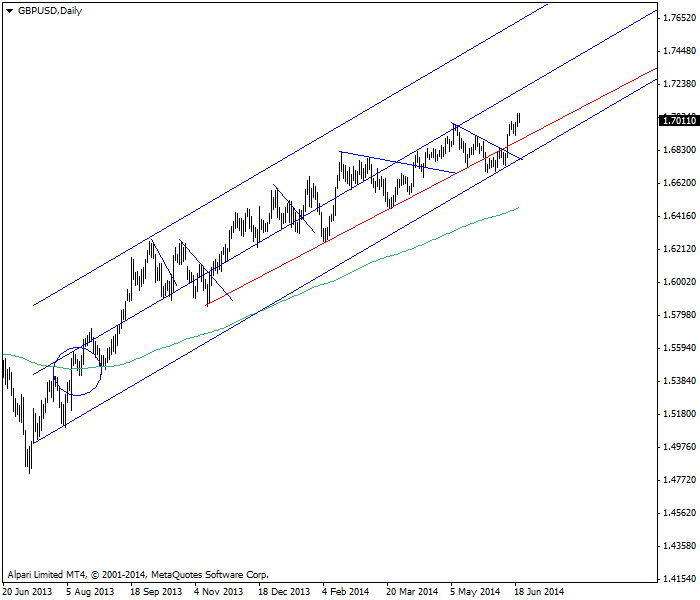 Consider the monthly chart of GBP/USD in the chart below. The extreme high was 2.1161 in November 2007 (as the global financial crisis was becoming evident) and the extreme low was 1.3498 in January 2009. Anyone who correctly analyzed the situation in the UK during that period had a huge gain on going short. More interesting is the recovery. Note that the bounce off the low carried the price to 1.7042 in August 2009 — more than the Fibonacci 38.2% retracement but less than 50%. Before then, around April, the astute analyst could foresee the correction developing and would become a buyer at around 1.5066. Would a true long-term trader have stayed long the pound all the way to June 2014, when it finally surpassed that pervious high (1.7062)? Those who engage in long-term trading are not disclosing that information, but plenty of “global macro” hedge funds and probably some sovereign wealth funds do trade in this manner. 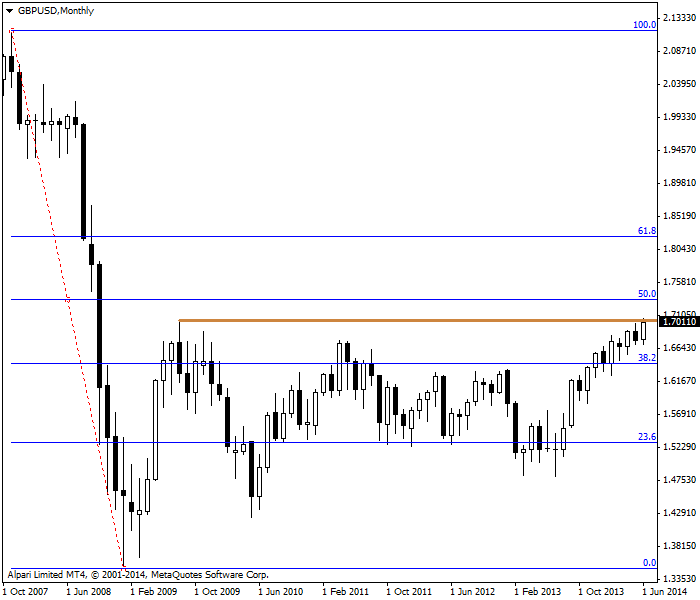 GBP/USD falls and then recovers on this monthly chart. Notice that this trade would have suffered a near-catastrophic pullback in May 2010 and a long period – lasting three years – of range trading, albeit in a wide range. Anyone judging trading performance on a mark-to-market basis would see only piffling gains until June 2014. A more satisfying version of the long-term trade would be less long-term — months, not years. See the weekly chart in the next figure. Here, we have a double bottom that is confirmed at the red horizontal line at 1.5751. A few weeks later, the price surpasses the green 40-week (200-day) moving average. We have a confirmed buy at 1.6226 at end-November 2013. As of the end of the data on this chart, the mark-to-market gain is 836 points. 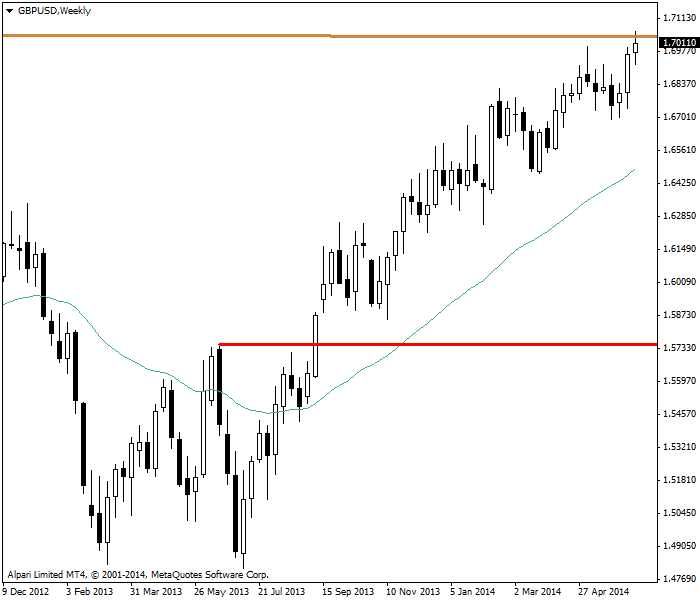 Trading off the double bottom and moving average breach on GBP/USD weekly chart looks more attractive. This gain demonstrates two features of long-term trading: first, you need patience and you need indicators, even simple ones like the double-bottom pattern and the 40-week moving average, that you have total faith in. You could have used other indicators that would have gotten you in sooner, but remember, you are not actively trading in-and-out. You like to hold for months on end. This trade is already seven months old. Secondly, the entry-to-exit gains in long-term trading tend to be enormous. Another version of the long-term trade is even less long-term and uses the daily chart. Here, in using the crossover of the price above the 200-day moving average, the entry is earlier, in August instead of November, and the entry price is 1.5508. The mark-to-market gain as of the end of the data on the chart is 1554 points. This is a vast gain and made on a single simple indicator. The chart also shows diagonal lines marking interim pullbacks, which are acceptable to the long-term trader. It also shows a red support line that runs parallel to the linear regression channel for over six months before it is broken. The long-term trader does not panic and exit on this breakout, because the channel itself is not broken. Besides, the long-term trader has been following the news about the robust UK economic recovery and comments from the central bank governor that rate hikes may come sooner than anyone expects. This example uses simple, basic indicators and nothing fancy to illustrate that long-term trading can be less difficult and stressful than day-trading. Long-term trading removes momentum and volatility indicators from the menu and uses only trend-following indicators. The drawback of using only trend-following indicators is that they give you bad guidance in range trading and untrended markets. 1. The long-term trader uses what type of indicators?